Sy Hieu PHAM received a Master degree in Advanced Materials for Environment from the Université de Toulon (France) and Vietnam National University (VNU) Ha Noi (Viet Nam) in 2018. His Master thesis was about the elaboration and characterization of the mechanical and piezoelectric properties of nanocomposite materials based on BaTiO3/epoxy systems. 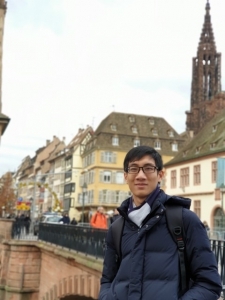 He received an Erasmus Mundus scholarship for a research internship at the Laboratory for Chemistry of Novel Materials under the supervision of Prof. Philippe Leclère. At the end of 2018, he joined the University of Mons and the Laboratory of Chemistry of Novel Materials as a Ph.D. student. His joint thesis is co-financed by UMONS and the Université of Artois (Lens, France), under the supervision of Prof. Philippe Leclère (UMONS) and Prof. R. Desfeux (UA). His research topic is about the elaboration of transparent electrodes based on metal nanowires for energy harvesting applications. The objective of his project is the elaboration and characterization by means of SPM techniques of the electrical properties of these electrodes with high levels of electrical conduction and transparency, while being flexible and compatible with manufacturing steps on large surfaces.